Jazz brings an amazing offer ‘JAZZ All in One’, for its customers. 200 SMS that can be used on all local networks! Furthermore, a consumer can decide on the usage of minutes/SMS in any category as they want thus providing complete freedom. For example all minutes can be used for international calls. Dial *101*1*03# on mobile screen and press send. Dial *101*2# on mobile screen and press send. The existing daily hybrid bundle offering 25 Mobilink minutes and 50 SMS for Rs. 20 will not be available from 23:59 Oct 19, 2010 onwards. However if a subscriber has already subscribed to a bundle, his voice minutes will become valid for any local number as well as USA/Canada(L+M), UK(L). In case of multiple subscriptions, the count of minutes and SMS will be added together and validity will be greater of the two subscriptions e.g. if a customer buys a bundle on 11:00 Oct 27, 2010 consumes 10 minutes and 100 SMS the same day (left with 10 minutes and 100 SMS available till 23:59 Oct 28, 2010) and buys another bundle next day 14:00 Oct 28, 2010, he will have 30 minutes and 300 SMS available till 23:59 Oct 29,2010. In case of purchase of a bundle before the expiry of previous bundle, the validities will be greater of the two but the destination of the minutes will be as per the last purchased bundle i.e. if a subscriber has bought all-in-one bundle and before the consumption / expiry of the bundle he has bought an on-net bundle, all the minutes will be converted to on-net; and vice versa. The validity of this bundle will be till next day at 23:59 i.e. if a subscribers purchases this bundle on Oct 22, at 11:00 then his bundle will be valid till Oct 23, 23:59. Is it ethically correct. ? Yar tasleem you are right. Is bande ka to style hi takhreeb kari wala hai, please be very honest when you comment about any thing. Everybody is not good in maths but mobilink is, to make subscribers fool. Subscriber on average don’t use more than Rs 12 of balance in a day. So charging Rs 20 for a single day will prove to be more expensive proposition for subscriber. These are the real figures by a telecom megazine. 20 Rupess, 20 minutes, 200, SMS, Rs. 20+ Tax 3.90+ Validity one Day. Look how mobilink is making its subscribers fool. If a subscriber has subscribed this offer and subscribes to any other bucket offer, all his/her offnet minutes will get converted to onnet minutes. Which is bad. Wrong information. its bad if you do these things on this true telecom blog. What a offer! that’s an amazing achievement, Mobilink, and I hope you continue to blurt others the same way. Do you have any proof to prove its in the benefit of subscribers. Bro, think for the achievement of its subscribers and not of mobilink only. A service can never win unless its user wins. Please tell me why you liked this offer? because i could not find any interest in it. what is this.?? u should at least check if the offer is valid or active before publishing it here!!! and i got subscribed to Jazz SMS Plus Offer! really being a ufone customer i think mobilink has won the race this time. My Friends, this is LIMITED TIME OFFER!!!!!! nUMBER CHAHEY MOBILINK KA HO LEKIN NETWORK KISI OR KA HI BEHTAR HAI. KEUN MOBILINK APNA NAHIN JAB IS KA NETWORK NA HO, OR JAB YEH CARD MEIN SE JAB CHAHE MARZI SE JITNE MARZI PAISEY KAT LE. Mobilink to humari pocket ko apna bank account samajht hai, mein to is ke fazol paisay katne se bara tang aaya tha. Bohat yaarana lagta hai mobinaqal ke sath. It will definitely be the copy of the package of another company. mein ufone tab se use kar raha hoon jab se yeh launch hua, kabhi bhi chhorna nahin chaha, or na hi is ne chhorne dia, ufone is a class bhai, jis race mein ufone aaya hi nahin us race mein ufone ko hara dia aap ne, ufone is unique, please remember, mobilink is ke kareeb se guzar to sakta hai par chhu nahin sakta. I am not convinced with you comments. really???? without nay logic you said really, yar imran bas kar ab hamesha tu jhoot jhoot pe jhoot bolta rehat hai. I think Mobilink top tier management is living in fools paradise. With this calculation a customer has to pay approx 900 rupees in a month. Whereas industry average revenue per customer is less than 200 rupess. Customer will have to pay 450 per month, not 900 as when subscribed, this bundle will last till 23.59 of next day. bhai mobilink bhi aik political party ki tarah awam ki waat laga rahi hai, loot loot or bas loot. You are right, mobilink management is just enjoying their high salaries and they do not put their efforts for it. Mobilink is old and sold. Whatever, still my dear 450 rupees is on higher side. Hah… My Friends, this is LIMITED TIME OFFER!!!!!! Heard about the shoot for this offer was full of mishaps and errors.Thanks to the agency ! Wake Up Ufone Marketing ! 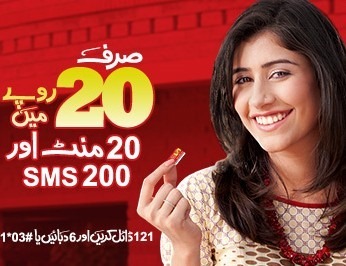 Mobilink ko uthao, ufone to kai saal se apne customers ko achhi services aur offers de raha hai. kia yeh khula tazaad nahee ! Why you are querrel with each others for offers…?? Why you don’t think that this offer is better than nothing..? ?